By 2030, Navigant Research projects that the future utility value chain will have transformed significantly. Many utilities have already embarked on their transformation journey, and the cycle of disruption appears to be accelerating. Utilities are considering new energy-based services that are contrary to the traditional supply-based model, where ...customers are helped to reduce their power consumption. Distributed energy resources (DER) present utilities opportunities (such as new revenue streams and business models) and threats (in the form of competition and the risk of irrelevance). Energy services will be built around customers' different needs and requirements. 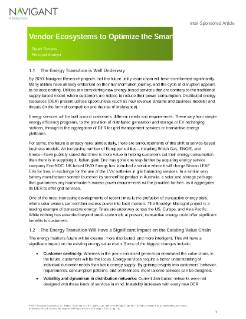 These vary from simple energy efficiency programs, to the provision of distributed generation and storage or EV recharging stations, through to the aggregation of DER for grid management services or transactive energy platforms. For some, the future is already here: almost daily, there are announcements of this shift to service-based business models. An increasing number of European utilities—including British Gas, ENGIE, and Eneco—have publicly stated that there is more value in helping customers cut their energy consumption than there is in supplying it. Italian giant Enel has gone one step further by acquiring energy service company EnerNOC. UK-based OVO Energy has launched a service where it will charge Nissan* LEAF EVs for free, in exchange for the use of the EVs' batteries in grid balancing services. In a similar vein, battery manufacturer sonnen launched its sonnenFlat* product in Australia, a solar and storage package that guarantees any householder's excess power requirements will be provided for free, as it aggregates its DER to offer grid services.